Home > Timing Belts MXL-XL-L-H... > XL Timing Belts. Trapezoidal Tooth Gear belts - 0.200" Pitch > 100XL050 Timing belt H/HTD. 100XL050 HTD Timing Belt. 10” Length. 50 teeth. 1/2” (0.50”) wide. 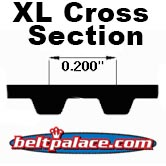 Neoprene (black rubber) replacement “100-XL Series” industry standard Timing Belt. Popular replacement belt for electronic equipment and power tools such as power sanders, woodworking tools & lathes, pumps, and robotic equipment. Toothed Gear Belts marked “100XL” at 1/2” Width. 100XL031 Timing belt H/HTD. 10” Length, 50 teeth, 5/16” Wide. HTD 100XL031 Timing Belt. 10.0” Length, 50 teeth, 5/16” Wide. Neoprene HTD 100XL-031 Timing belt 100XL-031. 100XL 037 Belt. 3/8" (10mm) Wide - 1/5" (.200/XL) Pitch. 50 Teeth, 10" Pitch Length. RMA Certified timing belt. Replaces: JASON 100XL037, GATES 100xl037, Browning 100XL-037, Craftsman/Sears part 1907109, DAYTON 1DHH5, Grainger 1DHH5, Richeng 100XL037, Great Wall belt 100xl037. 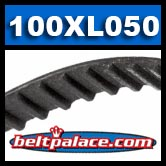 100XL-100 Timing Belt. Industrial Grade. 100XL100 Timing Belt. 10" (254mm) Length, 1" (25mm) Wide, 1/5" (.200/XL) Pitch. 50 Teeth.